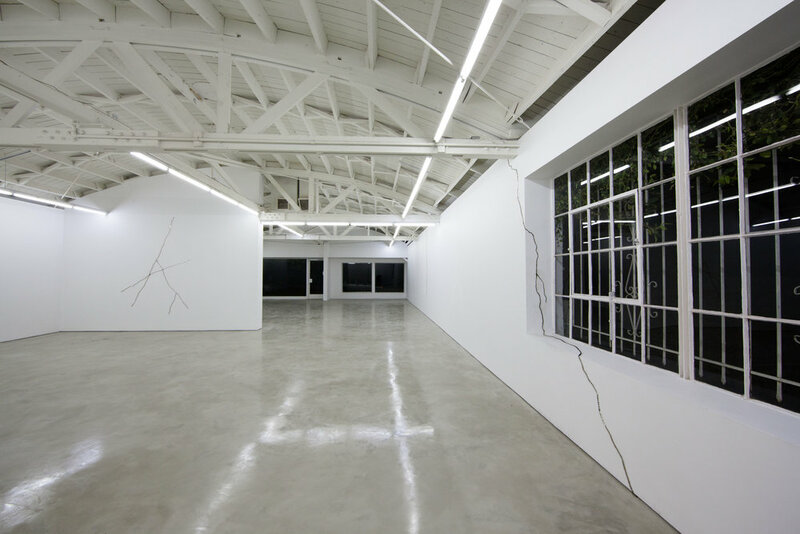 “Walking into Michael Genovese’s exhibition at OHWOW, a viewer might think there’s been a horrible earthquake, or that the space is simply in a state of disrepair. Snaking over the surface of every wall are large, meandering cracks, with unsettling implications for the building’s structural integrity. But this unease dissipates quickly. The fissures are in fact shiny and metallic, as if filled not with putty but quicksilver. And closer inspection reveals that they are not cracks at all but cut metal objects, affixed to the walls. This realization feels like a bit of bait-and-switch. Genovese’s installation comes on like a site-specific piece — an engagement with the space of the gallery itself. But the fact that the “cracks” are actually individual sculptural pieces that can be removed and possibly reapplied to different walls feels cynical. They are then just objects to be bought and sold. Not that there’s anything wrong with that. But additional context is provided by a photocopied book depicting fissures and lines of all kinds: cracks in the sidewalk, maps, zebra stripes, a pendant split into two halves.